With up to 30 different grades of cabin on some of the big ships, selecting your cruise accommodation can be confusing. You have chosen your cruise and are now trying to find your way through the maze of cabins – some big, some small, some with a window that doesn’t open, some with a restricted view, some for families. No wonder people get confused. Inside – these are the cheapest cabins, inside the ship with no window or porthole. Outside – these have a window or porthole but it won’t open. Balcony – these cabins have their own private verandas. 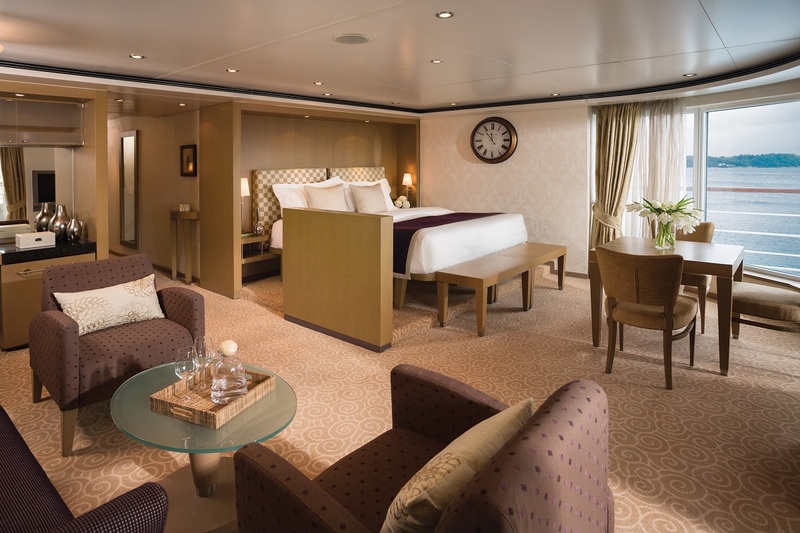 Suite – strictly speaking, a suite has separate sleeping and living areas (either different rooms or a curtain between the two), but some cruise lines use this moniker to mean a more spacious cabin. Another area of confusion for cruising newcomers is the term ‘stateroom’, which is simply a word cruise lines like to use because it sounds grander than cabin. But at the end of the day it is still a cabin. Staterooms come with a range of fixtures and fittings as standard including a TV (and sometimes a DVD), minibar and hairdryer, and most have private safes. All have ensuite bathrooms with tubs or showers (or sometimes both); the best cruise lines provide toiletries. In short, everything you would expect from a modern hotel room – and sometimes more. Cabin prices are determined by grade and location. Rooms on the lowest decks are the cheapest and they get more expensive the higher up you go. The most expensive suites are often at the very front and back of the ship, but you also pay a premium for a more central position. Which cabin you choose obviously depends how much you want to spend, but there are other things to consider. If seasickness is a concern, pick a cabin on a lower deck in the middle of the ship as there will be less movement. If you are sensitive to noise, avoid a room just below the lido deck or the gym, or close to the engine room; if mobility is an issue, pick accommodation close to the lifts. There are spa cabins and suites that come with perks, including free access to the thermal suite. If you are travelling with children, you may want to pick a cabin close to the kids’ clubs and children’s facilities. Most cabins are for two people, although more companies are adding single accommodation to cater for the growing number of people who cruise alone. Two-bedded rooms usually have a choice of double or twin beds, and many also have a third or fourth berth (either a sofa bed or a bunk that drops from the ceiling). These are good for families but can be cramped. For more space, choose a family suite or two cabins with an interconnecting door.